Could the most interesting game from the creator of Super Mario Bros. and Zelda that we've seen in years be a quasi-multiplayer game about security cameras? Could be. I played it and had a great, great time. The game is called Project: Guard, and it's keeping a relatively low profile at this years' E3. Nintendo omitted it and two other Miyamoto-led Wii U projects from their big Nintendo Digital Event showcase—their equivalent of an E3 press conference—and the game is sure to be drowned out by the hordes clamoring at this E3 for Nintendo's Smash Bros. and Pokemon games. There is nevertheless something special about Guard. To zoom out for a moment, Guard is one of three projects Miyamoto showed a handful of reporters on Sunday evening to ostensibly to both show what the great veteran game designer can do and to make clear that Nintendo is still thinking hard about how to make the Wii U's distinct screen-in-the-controller approach to console gaming more desirable. One of the three projects is a Star Fox game that I wrote about here and that could, frankly, go either way. Another is Project Giant Robot, which I'll describe below and am also skeptical about. First, however, let me tell you about Guard, because Guard is a winner. Miyamoto first demonstrated Guard and then asked for a volunteer to try it. I raised my hand. I was given a Wii U GamePad to hold in my hands. The GamePad shows the top-down blueprint-like view of a more or less square building that is full of hallways, doorways and corners. There are also 12 circles placed on that map. Each represents a security camera. I could use the GamePad's stylus to pick any of the cameras up and move them. I could tap on any of the cameras to then swivel them. The game is called Project Guard because the player is, well, a guard. You're trying to keep the center-most room on your blueprint safe. Enemy robots, however, will approach from all sides of your building, walk through open doorways and head toward the center to destroy whatever you have in there. Your cameras, and the ability to shoot from any one of them at a given time, are your defense. With the GamePad in my hands, I placed the cameras and then looked up at the TV. The TV's display was split. There was a central, large frame that showed the view of whichever camera I had selected. It was ringed by smaller boxes showing the view from all 12 cameras. I could use the left analog stick on the GamePad to swivel the camera I'd selected for the main view. I could press any face button to shoot a laser. Think of that action as similar to operating a turret in a first-person shooter. Once I said I was ready, the game started and the robots began to invade. At first, I was fine handling all of this by myself. I'd look at the TV, spot a robot on one of the security cameras, switch that camera to be the main view and then shoot the robot. I noticed that I could see the positions of numerous robots on the GamePad. They appeared as dots. I could even see warnings about which direction the next robot(s) would be invading from. I shot normal robots. I fired at tall blue robots that got shorter as I shot them. Someone called out from behind me to tell me that a bird robot was flying in. The bird robots will land on your camera and fly them away. Soon enough, I was overwhelmed. This is when the genius of the game revealed itself. Some of the people watching me started calling out cameras. They'd shout things like:"2!" "12!" "Bird robot on 7!" These spectators of mine were my allies! This ostensibly single-player game, I realized, was actually multiplayer. Everyone else was giving orders or advice. I was executing. Soon enough, I had shot enough robots to win, and Miyamoto walked over to me. I've interviewed him many times over the past decade. He understands English but has never said more than "hi" or "thank you" to me in that language. "You played on easy," he said to me, in English. 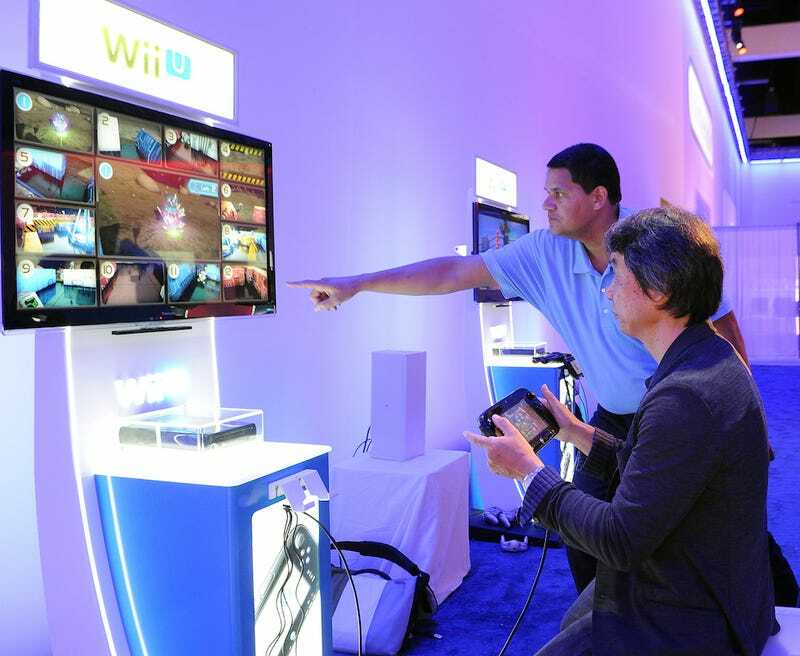 Miyamoto went back to demonstrating the game, but during a break, we were all invited to play more. I stepped back up to Project Guard and requested hard mode. It was away tougher. More robots. Trickier robots, too! There were stealth robots that would not appear as dots on the GamePad and that only showed up on the security cameras (meaning I HAD to keep scouring the TV screen and/or rely on others to do so). There were tank robots that I could slow down, bomb robots that I could blow up. The game was great fun, up there with the better mini-games in Nintendo Land as a showpiece for how much fun Wii U-centric gameplay can be. Like Nintendo Land, though, I was left unsure how effectively Nintendo could package it. Project Guard doesn't seem like it could be some sort of grand adventure. It's a small thing, easily expanded to include more maps and robots and the like, but hard to see as a full $60 game. (One observant reporter noticed that the cameras had Star Fox logos and asked if Nintendo was going to bundle this game with other Star Fox projects. Miyamoto dodged but noted that the robots in Guard looked like the robot in his new Star Fox game). Wonderful as Project Guard was, Project Giant Robot was strange. It puts the player in control of a slow-moving, customizable giant robot that goes one-on-one or sometimes one-on-three in what are sort of like giant robot sumo contests. Players can first build a robot by swapping and stretching the robot's upper and lower body, arm parts, leg parts and feet. The game is heavily-physics-based, to the size of all of these parts affects how the robot lumbers forward and how it strikes. The GamePad shows a first-person view from the robot's eyes. Through that view, the player can shoot a laser that can weaken parts of giant enemy robots. The TV shows what might as well be footage shot from a helicopter that is observing the giant robots' battle. The shoulder buttons on the GamePad allow the robot to advance or retreat (slowly). Pushing and tilting the thumbsticks controls the robots left and right arms in pushing and punching movements (slowly, too!). The gyro sensor in the GamePad seemed to be mapped to the robot's upper body and was used to establish or recover the robot's precarious balance. The aim of the game was to get the other robot to fall down while keeping your own standing up. The controls made it feel like I was a puppeteer, though the mechanics and trappings of the game might make the whole affair seem vaguely reminiscent of Nintendo's old Custom Robo franchise. The demo rolled out in four parts across four increasingly difficult battles against more or less randomized opponents. The ingredients for something good are here: the impact of customization on the game's physics, the sumo-like incentive to sometimes goad the enemy into falling, the impact of the presence of nearby skyscrapers on the conflict. That said, the game is not an instant-pleaser. It's tough to control. It's hard to tell whether what is happening is due to player agency or if, say, the robot is toppling because the game's physics are so touchy. It's also hard to say whether seeing through the robot's eyes on the GamePad is all that useful or important. The gyro controls may be important, but the GamePad display feels unessential in this one. They can't all be hits, and every experiment can't be a success. If, at worst, one of Miyamoto's three Wii U experiments takes shape, that's not too bad. If all three of the concepts can blossom into full, wonderful games, all the better. We're not used to seeing Miyamoto's ideas this early on. It will be fascinating to see how they develop.